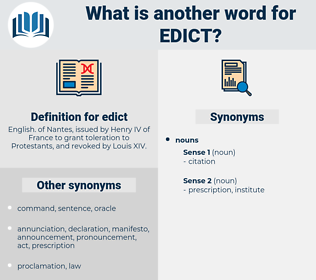 What is another word for edict? English. 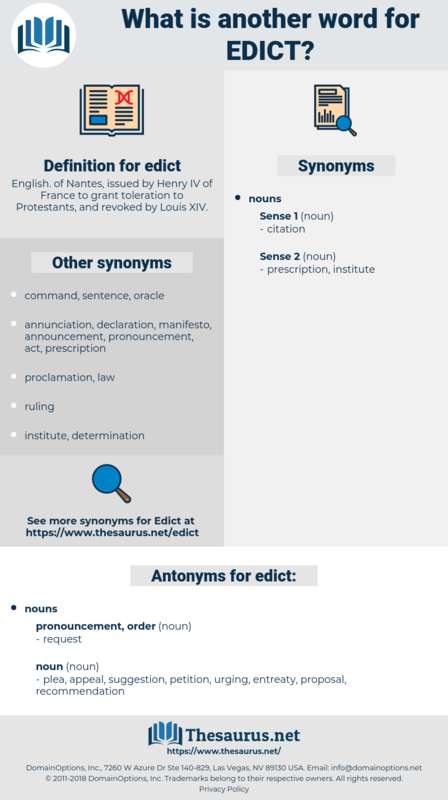 of Nantes, issued by Henry IV of France to grant toleration to Protestants, and revoked by Louis XIV. plea, appeal, suggestion, petition, urging, entreaty, proposal, recommendation. The edict had gone forth forbidding the passage of many measures that would have given to the colonies more freedom than the mother country thought best. The new squire had outlined a plan that every suspicious character found in the place should be apprehended at once, and no sooner had this edict gone forth than the suspected ones very quietly took their departure. educated, edacity, ethicist, educate, etiquette, edged, educatee, etched.